Intro: What is Video Streaming? If you have never heard of the term before, it might be worth checking out this BBC article to get a basic understanding. Safe to say, the main idea is that it involves the transfer of media to an audience in real time, without downloading the content first. When you think of watching a standard Youtube video, this is video streaming. ‘Livestreaming’ is subtly different and is referring to the fact that the stream is taking place live, at that point in time, and starts and stops when the broadcaster chooses. Streaming technology has been around for fair while, since the 90s, once computing power and data transfer speeds reached a point that allowed it. Historically, video streaming has been a very one-way affair, with large companies or people with a lot of spare cash able to afford the infrastructure necessary to broadcast. This meant that most people were only able to take on a passive viewing role, but this has been progressively changing with the introduction of high speed home broadband. Now we’re half-way through 2015, looking back over the last five years we have seen a serious growth in ‘personal’ streaming (read up on Justin.tv), and a slow reversal of the established ‘users as consumers’ mentality. The technology has advanced to a point where a large number of people can easily and cheaply broadcast themselves. 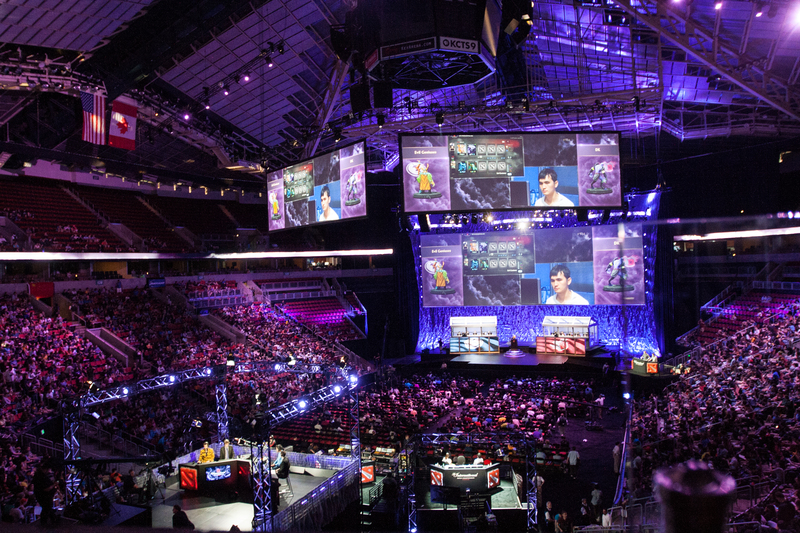 If you haven’t heard of e-Sports, you can find out more about it here, but needless to say this new competitive industry has seen an explosion in popularity, and owes it’s success to the technology that allows us to transmit and receive such high quality video as if we were sitting right in front of our own screens. Even in the corporate environment, we can start to see a slow move away from wide-scale video-conferencing installations in favour of more flexible solutions as the hardware required for such an undertaking becomes smaller and more portable. The next few years will be big for personal streaming, and has seen the appearance of services like Meerkat, Periscope and Skeegle (watch this space) which allow you to stream video directly from your smartphone to, well, pretty much whoever you want! Yes, we have come that far. Nine years ago we discovered the potential of tweeting a picture of our breakfast to our friends, now if we so choose, we can stream ourselves eating it to the world! On a serious note, you may have already started to think of some really great uses you could put this to, and my purpose of writing this article is to show you only one of the many ways you can get started. You may have already taken a look at one of the three mobile streaming services I mentioned above, and if you want to have a crack at that, this article will really help you out. But for now though, I am going to explain how we can stream using a webcam and our desktop simply using Youtube and Google Hangouts on Air. First off, you will need a Google account to use Youtube, so if you don’t have one you can create one here. I’m going to boldly assume you do have one and continue on regardless! Step1: First, we want to go to Youtube.com and sign in if you aren’t already. 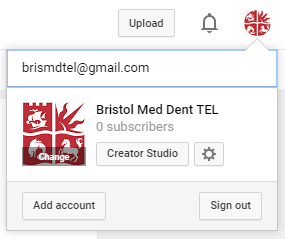 Next we want to go to Creator Studio, which is accessible by clicking on your ‘account’ icon in the top right and clicking Creator Studio. Step 2: This takes us to a dashboard where we can see any videos we may have uploaded to Youtube ourselves, as well as a host of other video editing and community management options. However we want to go into Video Manager, and once you’re in there, you want to click on Live Events on the submenu on the left. Step 3: Click ‘New Live Event’ in the top right to get started. Public: anyone can search for, and watch your stream. Unlisted: you have to give people the URL to your stream if you want them to watch it. Private: only you are able to see it, and if you specifically invite people to watch it you are limited to a certain number of viewers. If you click on Advanced Settings, you can change quite a few things according to your taste, you may want to disable the Youtube Chat stream during your broadcast, for example. For the purposes of this test, you should leave ‘Type’ set to ‘Quick’. The more adventurous among you might want to try broadcasting using other software like OBS but that requires a lot of separate configuration that I don’t want to cover in this article. Ready to go! You will now enter a Google+ Hangout On Air so you can stream live from your webcam. 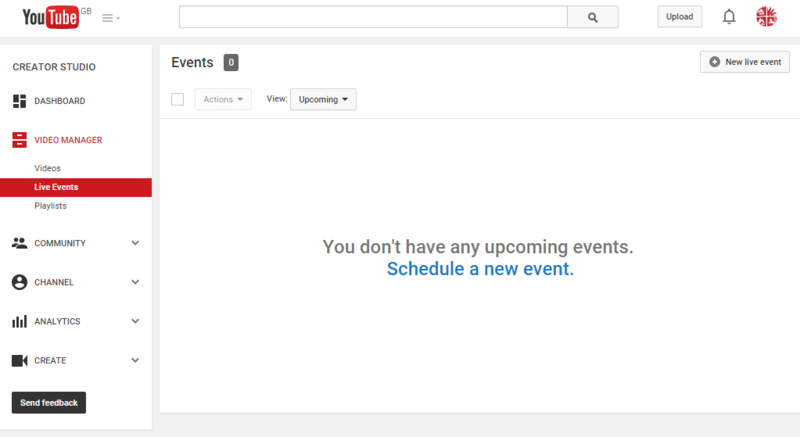 If you meant to schedule your live event for later, please click “Cancel” and edit your event time. Press OK and Google Hangouts will launch. If you need to install anything here you will be prompted to do so, and the installation process should be fairly straightforward (just a matter of following a couple of on-screen instructions that involve clicking Next). Step 5: In Hangouts, if it isn’t already live, you can click the green ‘Start Broadcast’ button at the bottom to get going. Congratulations, you’re now on air! At this point you may be thinking, “OK, great, but what are people actually seeing here?” – well, assuming you have a webcam connected the only thing being captured right now is the video and audio from that. You might be content with just this, but it is good to know that at this point you can also choose to broadcast your screen and invite other people to join you in a call (exactly like a Skype call). If you hover over to the left hand side of the Hangouts window you will see an option to choose which screen or window you’d like to share. At any point in this process you can check out what your viewers can see by going to Youtube: My Live Events and clicking on your stream, but do note if you are sharing your screen your viewers might also see this. To end your broadcast, hover towards the top of your Hangout window and click on the red ‘end call’ button. You’ll be happy to know, Youtube saves a recording of your livestream so you can look back and see how it went, or share it on for people who couldn’t make it. If you weren’t happy to know that, you can just delete it. Now’s the time to give yourself a well deserved pat on the back- well done on your first live stream, it wasn’t that hard, was it!